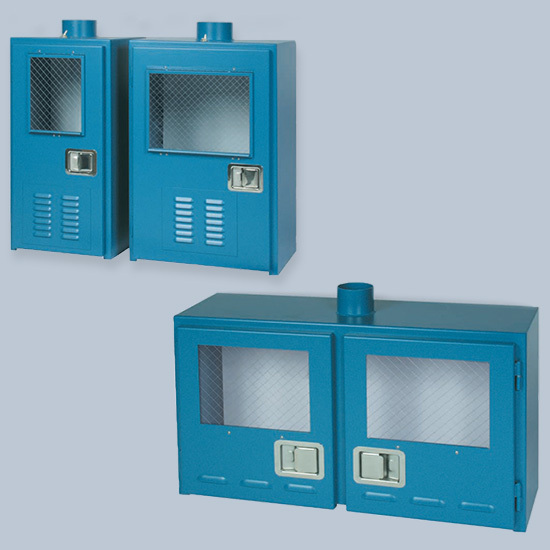 The Safety Equipment 3000 Series Compressed Gas Cabinets were designed to hold 2” diameter Lecture Bottles, Small Capacity Cylinders or use as a Valve Manifold Box. Constructed of high quality materials for long life and ease of use. Our compressed Gas Cabinets meet or exceed all existing code requirements worldwide. Custom features and cabinet configurations are available upon request. Safety Equipment has been supplying industries with compressed gas cabinets since 1979. Extra heavy duty steel construction 11 gauge steel (0.119 inches), thicker than code requirement. One piece body construction for safety. All welded construction including hinges. Cabinet is ground smooth for clean room capability. Louver panel acts as pressure relief vent. Protective enclosure prevents accidentally hitting regulators, valves, and purge assemblies. All cabinets are constructed using 11gauge (.119-inches) thick steel. Sub-flooring is provided to eliminate rusting of the cabinet’s bottom. Adjustable cylinder brackets allow for precise fitting to pigtail. The cabinet door and clear fire-rated window will close and latch automatically. Welding is used whenever possible in order to achieve maximum strength and to aid in easy removal of components for repair and/or replacement. All fasteners used to mount components such as windows, door handles, purge assembly mounting panels and cylinder brackets are of stainless steel. Inside cabinet finish is smooth to maintain a clean environment and outside surface is slightly textured to maintain appearance. The exhaust vent is located on top of cabinet. Louvers allow air to enter cabinet for exhausting. They are located on the lower part of the door, which provides maximum coverage of airflow through cabinet. Back panel, which mounts valves, regulators, and purge assemblies is mounted to facilitate air flow behind panel for complete internal cabinet exhausting. Cylinders, valves and purge assemblies are isolated from accidental contact, vandals, and other assemblies, thus avoiding leaks. Cylinder brackets will hold cylinders in the event of a fire or earthquake. A filter can be mounted on the inside of the cabinet door behind the louvers, allowing for process protection by minimizing contamination from ambient air impurities. Windows permit visual inspection and/or access into cabinet for adjustments while minimizing operator’s exposure to potential toxic leaks. Water sprinkler heads on ceiling of cabinet activate between 160°F and 165°F and are coated for protection from corrosive environments. Click here to download the 3000 Series PDF catalog.